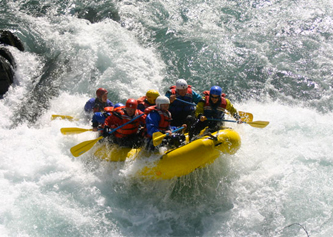 Guides with previous commercial rafting experience are given preference for hiring. The highest preference is given to guides with previous commercial rafting experience in OAR boats, but guides with previous paddle rafting experience are definitely encouraged to apply. All first year guides must complete 15 training runs on each section (whitewater section and float section) of the Nenana River as well as pass a check ride and flip trip with senior staff who may at that time approve or disapprove of their skills proficiency. All training time is unpaid. Skills proficiency on the Nenana River must be demonstrated before guides may take guests down the river. River guides are expected to have up to date certifications in advanced first aid and river rescue training. At Nenana Raft we prefer the Swiftwater Technician Class certified by Rescue 3 International. Each year in the spring Nenana Raft Adventures offers classes allowing candidates to obtain these certifications. The advanced first aid class is one approved by the State of Alaska’s Division of Emergency Services and is a class leading to Emergency Trauma Technician (ETT) certification. Nenana Raft's SRT instruction and certification program is taught by a Rescue 3 International certified instructor. All successful participants in this class will receive documentation issued by Rescue 3 International and signed by Nenana Raft's SRT instructor attesting to their successful completion of the course's requirements. Candidates from the Lower 48 frequently substitute Wilderness First Responder certification for the ETT certification. Candidates who select the in-house Nenana Raft training must pay for their ETT and SRT training. Normally the combined cost of both these classes is just under $500. Compare this with the $500 course cost of Wilderness First Response training alone. Nenana Raft makes every attempt to provide its employees with high quality reasonably priced training. 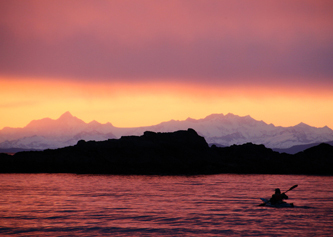 Some individuals with no previous commercial guiding experience but perhaps having private boating experience may not wish to begin employment with Denali Paddlesports in a support role. These individuals are also invited to apply for raft guide positions. These candidates must pay for all their training, including the above listed Advanced First Aid/Wilderness First Responder and SRT certifications and, additionally, boat handling skill training. The total cost for this training is approximately $1,000; flexible payment terms are available. An invitation to train is just that is just that: an invitation; it is not a guarantee of employment. There is no guarantee that at the end of this training you will be hired although typically more than 3/4 of those who complete the training are offered employment with Nenana Raft. Unfortunately, a few folks with a lot of desire, even after a lot of training, are unable to navigate safely the waters of the Nenana River with a boat load of passengers, and we cannot sacrifice the safety of our guests. We recognize that there is an element of financial risk with such a proposition and we make every effort to be fair in terms of who is invited to participate in these classes. Unlike some companies in the Lower 48, Nenana Raft is not in the guide school business; we are in the raft guiding business. Nevertheless, Nenana Raft has previously hired persons who had considerable private, but no commercial, boating experience. Those individuals who successfully completed their training and were hired by Nenana Raft as river guides all became excellent guides. Guides must provide their own personal equipment, including drysuit, river booties or shoes, whistle, knife, carabiners, type V PFD, etc. With respect to footwear, there is a fair amount of sharp rock on the Nenana River. To prevent foot injuries, sandals are not allowed to be worn on the job by employees. Applicants offered a position will be required to sign an employment agreement that normally requires, among other things, a full season of work (unless prior arrangements are made). Guide guests safely down the canyon (Class III & IV) and wilderness run (Class II & III) sections of the Nenana River. Fit guests with drysuits and PFDs and assist them with this gear. Conduct a safety orientation talk for guests about to embark on a raft trip. Rig boats with appropriate gear for the trip type. Converse with guests about the climate, history, wildlife, geology, and plants of the Denali area. Treat all guests with courtesy, remembering whose vacation it is. Maintain friendly, positive attitude towards guests and coworkers. Assist in the maintenance of equipment, e.g, wash river booties, repair gaskets on drysuits. Lift and stack heavy boats onto trailers; unload and launch boats. Safely drive shuttle vans pulling trailers loaded with rafts. Frequently check and help maintain a scheduling board. Be a team player. Display good judgment. Be dependable, punctual, willing to abide by Nenana Raft’s criteria for employment. Be willing to assist management with the repair and maintenance of all physical facilities.